This Trolls Movie lunch box is a cool and stylish way to make school lunches fun. This awesome dual compartment soft lunch bag offers children an easy way to tote along their favorite meals and snacks with two separate storage compartments for easy storage and crush-proof lunches. 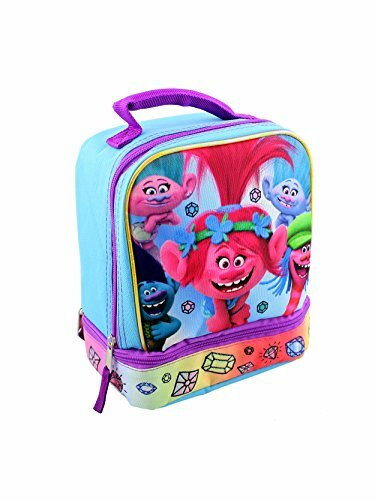 This lunch box features DreamWorks Trolls characters: Poppy, Branch, Satin, Cooper, and Chenille! It's the perfect lunch bag for any Trolls fan! Lunch Box measures approximately 9" x 7.5" x 4"
Food-safe and PVC-free; Wipe clean with a damp cloth; Yankee Toy Box Exclusive! Features Trolls Movie characters: Poppy, Branch, Satin, Cooper, and Chenille! It's perfect for a day at camp or for back to school! If you have any questions about this product by Trolls Movie, contact us by completing and submitting the form below. If you are looking for a specif part number, please include it with your message.